My Seminary students love playing games, and are very competitive! Whenever they get together, out comes the Risk, Playing Cards, Apples to Apples, etc. 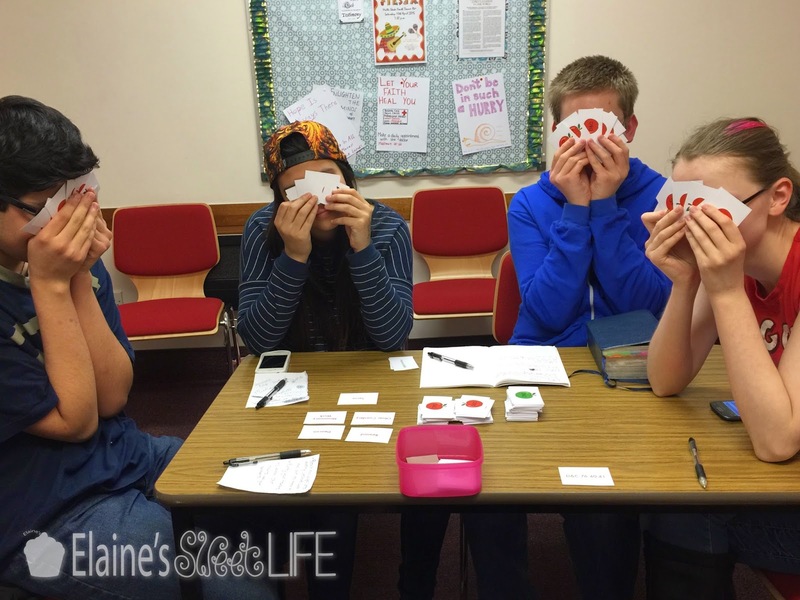 Games have become quite a significant part of our Seminary lessons too, it keeps my students engaged and interested in the lessons. Never do they read and understand scriptures better than when doing so earns them points or some kind of advantage. Now, I understand that not everyone thinks that games belong in Seminary lessons, but it works for the particular students I have right now. I try very hard to make sure they are not just games for the sake of games, but rather use them to enhance the lessons or build on Scripture Mastery knowledge. 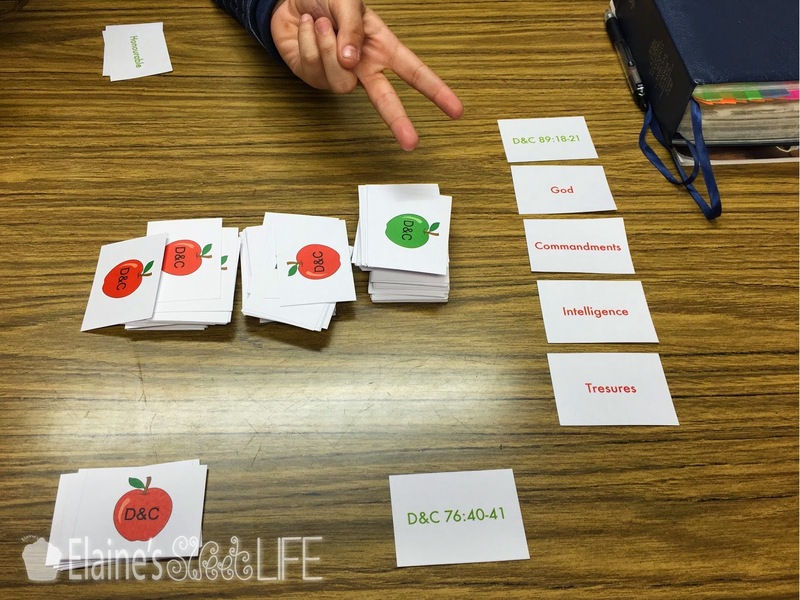 I am finding that the students (and I) are getting tired now though, as the Seminary year has progressed, so I have introduced a new game that isn’t specifically linked to Scripture Mastery, nor any one lesson, but on the Doctrine and Covenants as a whole. I use it as a short game either at the beginning or end of a lesson, to either wake the students up, or give them a break and a bit of fun. My game is based on Apples to Apples by Out of the Box and Mattel, and is played by the same rules. Each player holds 5 Red cards, one player - the Judge - picks a Green card from the pack and places it in the centre of the table, face up. Each of the other players choose a Red card from their hand that they feel best suits the word on the Green card, then place them face down on the table. The Judge collects all those Red cards up, shuffles them then lays them face up on the table. They then decide which of the Red cards they think suits the Green card best. While they are making their decision, the other players try to convince the Judge to pick their card - here is where strategy comes in, you don’t want the Judge to know which card is yours! Once the Judge has picked a card, the player who put that card down ‘wins’ the green card. The played Red cards are discarded. Those who played a Red card draw a new one from the pack. Play continues with the player to the left of the Judge becoming the new Judge. The winner of the game is the player who has the most green cards at the end of the game (we never play to a certain number as it takes too long, but rather play to a time limit). 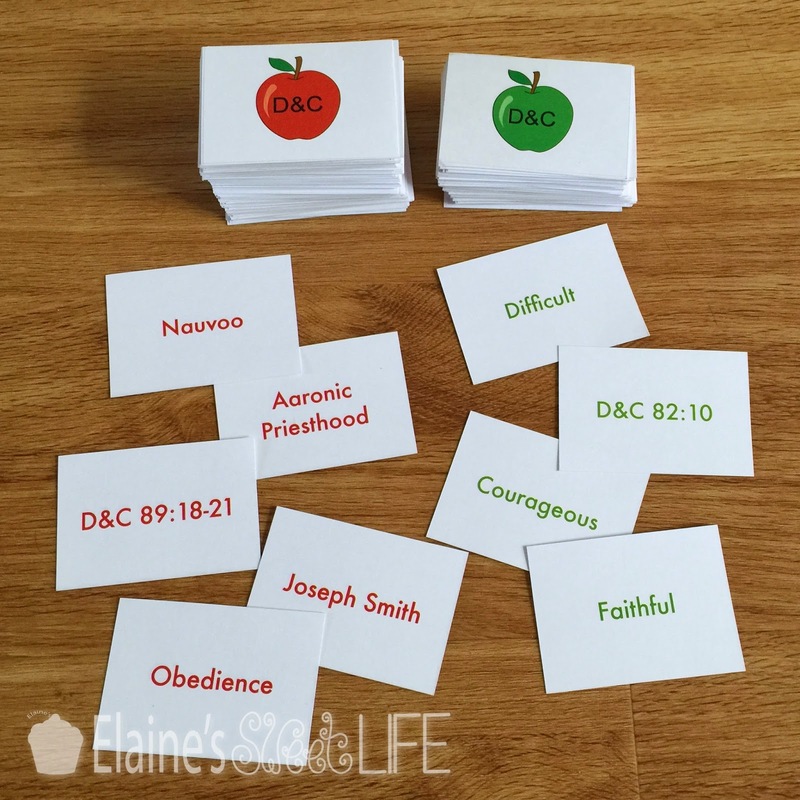 While playing, my students may only use their D&C / church knowledge to ‘help’ the Judge choose a card. Once the Judge has chosen a card, they must justify why they chose that card - again, using their D&C / church knowledge. Any Scripture Masteries are to be quoted. If a student gets a card they don’t understand, they may use their scriptures to look it up (or a dictionary if it is not a gospel specific word). My class is small, so we can all play the game together. If your class is large, perhaps you could make multiple decks and your students can play in smaller groups. I am sure there are other ways that the game can be played - please comment below if you have any good ideas! These are the cards I have made, click HERE or on the image above to download the pdf. For a set with American spellings, click HERE. It is a 24 page file - 8 pages of Green cards, 14 pages of Red cards and 2 pages for the backs of the cards (352 cards in total). Print out the first 22 pages onto white card, then put them back into your printer and print the backs using the last two pages (make sure you put them into your printer the right way around!) Each A4 page has 16 cards on it, and I have made them edge-to-edge, so you can just evenly divide the page in to 16 (4x4) and cut it up (I use a metal ruler and an exacto knife, that way I can cut many pages at once). If you use a different page size, just scale the image down to fit your page, then trim any excess off before splitting the page into 16. I haven't included any cut lines because I found that my cards all came out slightly different sizes when I did that (printers don'y print exactly straight) and I got a better result without cut lines. If you would prefer to have cut lines, just let me know and I will provide a copy of the file with them. I hope you enjoy playing - let me know what you, and your students, think! And if you feel that I have left any cards out, comment below and I can add them to the pack. Thank you for your time and effort with this game! I'm excited to play it with my seminary class. Thank you so much Patricia, I hope they enjoy them too! Why don't you take a moment over the holidays and bake a cake? I can't wait for the summer - only 6.5 more Seminary weeks to go :) It's been a great year, I have learned so much and love my students, but I am starting to feel a bit burned out and very much in need of the break! Can we pin this? It's sooooo cool! That's great! How did the game go? How wonderful! By any chance do you have a set for the Old Testament?